Q: Is there still a future for Filipino comics? A: The hope for Filipino comics burns brightly. Komikon is the only gauge I can think of because it is a regular event. The number of young people who have the inclination in comics is increasing yearly. I call the people who join Komikon idealists because they keep to their vision of creation. What Komikon does is it keeps the engines of these creators coming. They make three to four platforms every year to help talents spread their wings and prevent creative juices from drying. Q: Is it important to develop a local style in the revival of Philippine comics? A: It was only Japan who was able to make their own style or trademark in comics. In the Philippines, comics are “makutkot” or detailed. It can be a trademark of the Filipino comics but it boils down to the survival of it. If there’s still no appreciation and patronage of comics in the country, it won’t survive. A lot of comic artists don’t give much importance on style or trademark; they are more after the readership of their craft. Q: How do you think political satire in the Philippines is received by the local market today? A: The most effective way to reach wide readership is through bookstores. But for some reasons, mainstream outlets are not hospitable to publishers, especially to small publishers. They do not allow satirical comics of politicians. I have experienced this kind of rejection by a bookstore. I came up with a satirical comic entitled “Wahaha” – a satire on 2004 Philippine presidential election. Maybe it has something to do with the editorial because not everything we write can be published. Like a real art, comics also need to be curated. 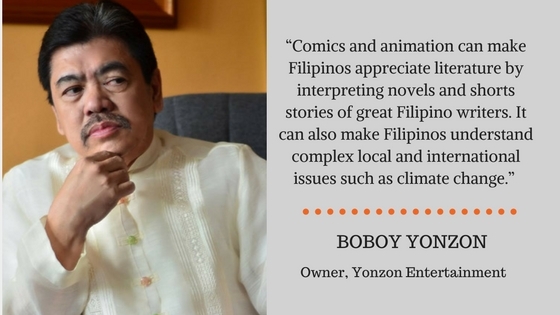 Boboy Yonzon gave a talk on the history of Filipino comics entitled "100 years of Philippine Komiks" at the 2016 Philippine Animahenasyon Festival held on November 22-24, 2016 at Samsung Hall, SM Aura, Taguig City.